A premium vegetal silica supplement that provides the silica you need to maintain strong, healthy hair, nails, and skin. It’s prized for its ability to help restore natural beauty by providing valuable nutrients to skin, bones, hair, and nails,* but unfortunately much silica is lost in many food sources due to over-refining and processing. 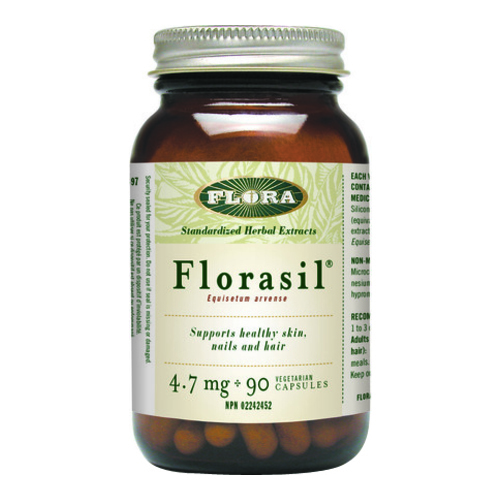 Supplementation with a carefully prepared and easily absorbed form of silica, like FloraSil, can help provide the silica your body may be thirsting for. NPN Claims Supports healthy skin, nails, and hair. Source of silicon for the maintenance of healthy skin, nails, and hair. • Adults Take 1 to 3 capsules daily with meals. Store in a cool, dry place. • Adults (for healthy skin, nails, and hair) Take 3 capsules daily with meals.